The lyrics about crashing a party and how one person’s actions and his thoughts, intents, and understanding don’t seem to add up is very much my experience when mingling with people. Showing up early as I understood was polite is seen as “being weird” because “nobody comes on time, you’re supposed to come late to parties!” Or talking about travel experiences and volunteering, isn’t exactly the conversation topic since people interpret it as “boasting” and trying to “look cool” instead of talking about “normal” things. Then when I’m not taking it well, they see my detached disposition as being proof I’m “weird” since I don’t react “the same way everyone else does”. Then it’s all a bunch of talk and noise coming from me, and all these terms of “Third Culture Kid” and “hidden immigrant” might as well be a tiger roaring because it goes over their heads, and I understand how they feel and what makes them think that way, but anything that comes out of my mouth is so out there it’s not even foreign, it’s alien. 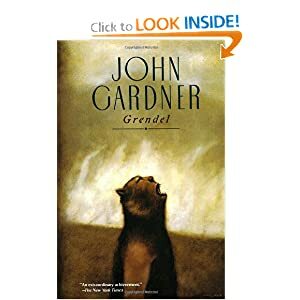 That is one thing that goes on in John Gardner’s Grendel: Grendel, the monster of the old poem Beowulf, is alone and lonely, left with his thoughts, watching people and life around him. He understands because he stands outside of the culture and context of humans, he even understands their language, but they don’t get him at all. For that misunderstanding, he spites them while being curious and wanting to connect to others. Then he’s left alone with those thoughts and lashes out at them to let them know “Hey, I’m still here!” because an antagonistic relationship is better than no relationship and being alone in the universe. And ultimately, it’s that conflict that motivates people to grow and adapt, so he offers a necessary “evil” because without him, they would make their own monsters or stagnate without this constant need to overcome themselves. “If I’m crazy yes it’s true, and it’s all because of you, you wouldn’t want me any other way. You may be right, I may be crazy, but I just may be the lunatic you’re looking for”, sings Billy Joel. Grendel is driven crazy by his need to connect and be freed from his loneliness (and boredom). I’m questioning my sanity the more I encounter people who say that my mannerisms are either “too polite and not genuine” or that I’m “mean because I use big words and make people feel dumb”–actual responses taken from adults who don’t even know the meaning of “hubris” and “facetious” which I use in conversations casually, or called a liar because my life story is “too fantastical to be true”. Call me Grendel, baby, because if people are going to make me a beast, I’ll be a party monster. Might as well have fun being an outsider, I say. Think of all those wonderful artists and ideas who have influenced much of human development: Dadaism, Hunter S. Thompson, Jack Kerouac and the Beat Generation, the inventors of the airplane, the elevator, and Internet, and Vincent Van Gogh–they were all crazy and they knew it, or they were surrounded by sheeple who drove them insane. Back in the 1980s and 1990s, it was this revolution to recycle, reduce, and reuse before people went back to not giving a crap, and now those of us who stuck to our guns aren’t those environmentalist radicals, but saying “told you so” as reality comes and proves all the naysayers wrong. Who grows first before the sheeple catch up? Grendels and artists, but we also die first. Who understood the importance of globalism and interconnectedness before it became fashionable to backpack alone in Europe or Southeast Asia, volunteer in Haiti, or teach English in China and Korea? Us travelers, artists, humanitarians, and those who were flung into it, the Third Culture Kids, and our lives are art not because we chose it to use that primal energy of creation–it’s because we have to in order to adapt and survive, otherwise our madness becomes insanity. If you’re thinking further ahead, then you do what Hunter S. Thompson did: make money off of being crazy, because when the going gets weird, the weird goes pro. Either you get paid for your craziness, or you pay for it while spending time in the loony bin. Yeah, we’re all lonely, lost, and confused; we all wonder if we’re crazy, or if we are the monsters they say we are. But let’s throw this into perspective: if the dragon terrorized Grendel, his mother, and the humans alike, they’d probably find they had a lot more in common than just being monster chow when realizing they all shared the emotion of fear and need to survive. So then, the question is, what do we do with the insight of Grendel the outsider who understands his own situation and has an arguably stronger grasp of people and “civilians” than they have of themselves or this reality? Either we look different or think differently, like the blonde-haired and blue-eyed Thai speaker or the Vietnamese German speaker amongst the Thais and Swiss respectively. What do we add and how do we make them recognize what we bring to the table without dismissing and ostracizing us as something crazy? Until we figure that out, then whenever the question of where people fit into the picture comes up, we’re either going to have to accept we’re Grendel to them at times, or we’re going to have to love it and know that even if we’re crashing parties, we’re not going to be invited and welcomed unless it falls into their definition of acceptable freak. And by acceptable, I mean one that either people know what to expect and pay to see. Because everyone is a freak (if not an outright Grendel) in his or her own way, but if you can’t put into words something that can be easily understood, then you’ll have very few open or brave enough to take a chance with the unknown. I’m Grendel, and I can be more than that to anyone willing to buy the ticket and take the ride. I’m Grendel, and I know what I am, so I’ll rock out alone in my bedroom or out on the dance floor until someone tears my arm off. Because maybe, it’s the guy who tears my arm off that understands me better than the rest of the folks instead of running and hiding, since he’s the only one who attempts to engage me. Oh, and apparently, he’s an outsider too, the foreigner that they like and want instead of the one they had. But since I’m not Beowulf, I’m Grendel, so I’ll just be rockin’ out Billy Joel style. This entry was posted in Arts, Life, Music, Third Culture Kids. Bookmark the permalink. I loved Grendel. I equated him always to David Merrick: The Elephant Man. I always saw Grendel as a misfit as well as a deformed human who, back in those days, was looked upon as monsterous. Grendel had a loving mother. He meant no harm, but was an outcast and misunderstood and shunned from society. Look what happened to Frankenstein’s monster. Another misunderstood creature reacting to hate. i would love to see you turn this passion you have into something positive – realizing that your life is “your normal” and can’t be compared to anyone else. There are people out there who will listen, be open to new ideas and new faces. You are our future. Be kind to those too ignorant to “get it” for blessed are the humble and the meek, and the “stupid” for they too are children of God…. I actually did an entry on how I related to Frankenstein and TCKs in a parallel manner. Look it up in the archives. I’ll give you a longer reply later; I’m in Sumatra now helping kids with a malaria problem–which should answer part of your wishes for me to be turning this passion into “something positive”. P.S. : his name was Joseph Merrick.